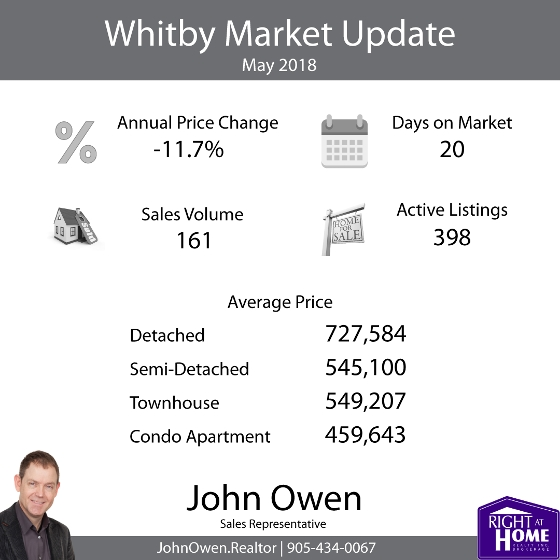 Durham Region's real estate market has shown mixed results as May 2018 figures show a substantial drop in sales volume combined with a less impactful drop in prices. 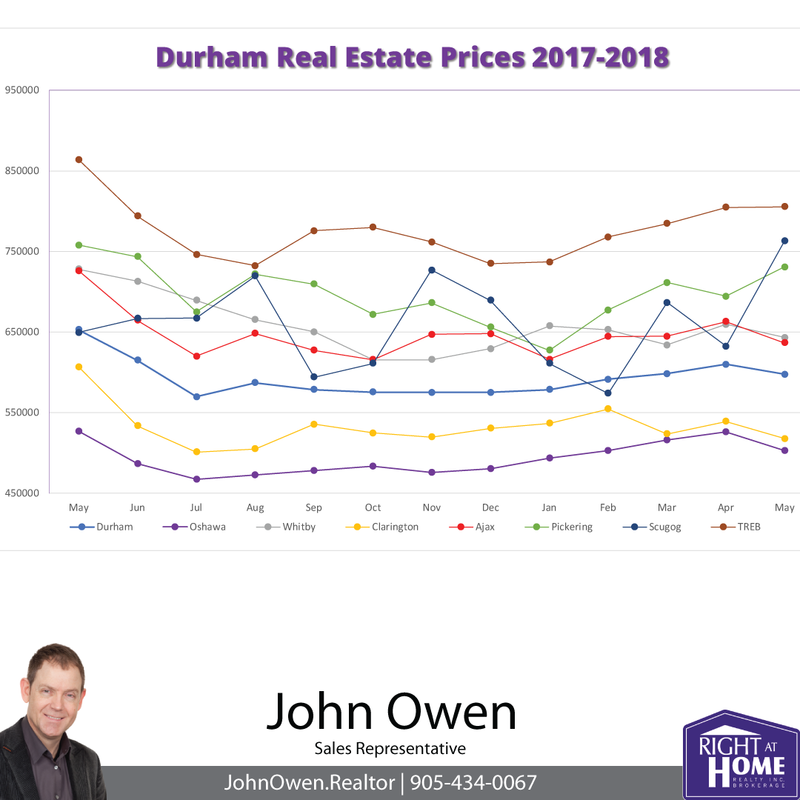 Prices are beginning to taper off over much of Durham Region, after trending upward for several months in a row, and there is more inventory for buyers in a stark contrast from last year's craziness where scant inventory led to frenzied bidding wars across the region. 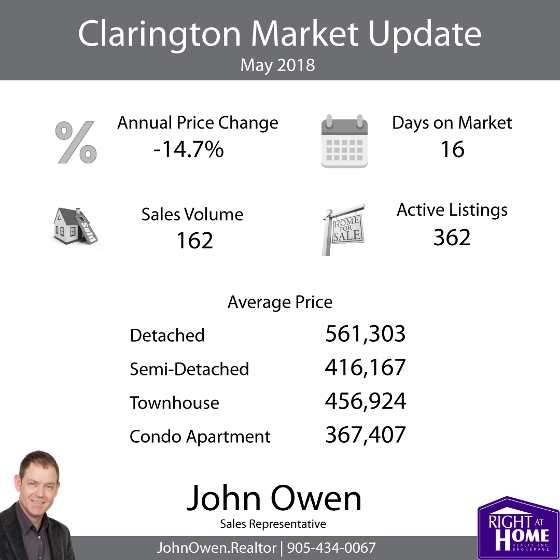 Durham Region prices dropped 8.5% compared to May of 2017, but only were down 2.0% from April 2018 levels. Now that we have reached late spring, comparisons to 2017 are becoming more typical than we saw up until April. Average prices for all of TREB are still higher than August's low, as shown in the following chart (burgundy line), though the numbers since October are following a more typical price trend that we saw in the previous year (as prices were mostly rising regardless of season). Most of the areas in Durham Region (blue line) and Oshawa (purple) have increased since their low point in July, with varying performance since then. 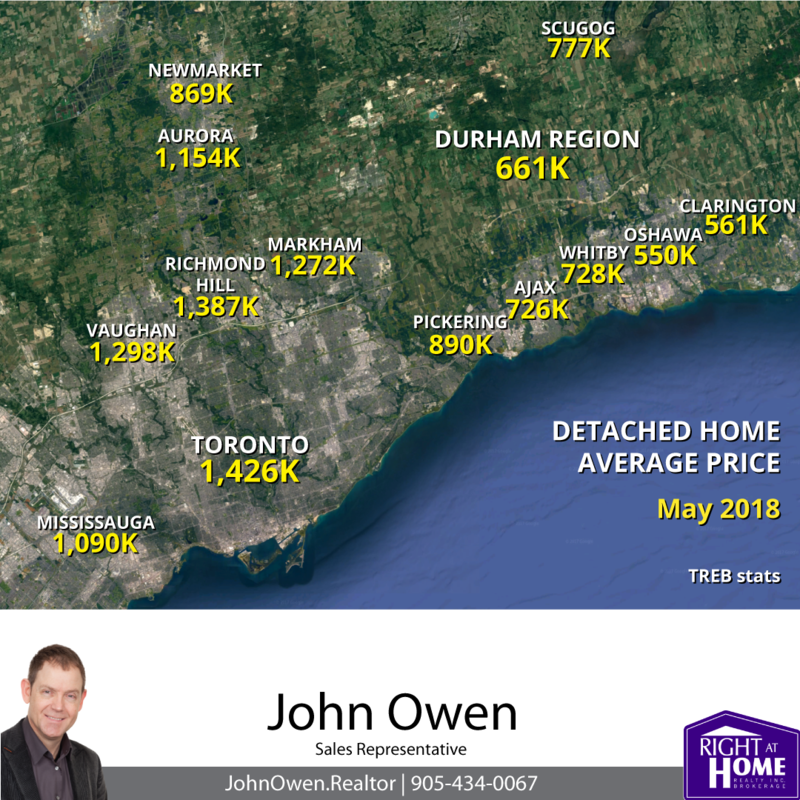 The Toronto Real Estate Board's (TREB) latest market statistics show the average Durham property at $597,485 - down slightly from last month's 609,813 by $12,328. Sales volume fell 34.4% with 859 units sold versus 1309 last May, and also lower than April 2018, when there were 930 transactions. The average selling price of homes in the GTA this May was $805,320. This represents a 6.8% decrease since May 2017. Sales volume was down 23.2%. Active listings within the board increased 13.2%, which shows a shift in market fundamentals. The jump in inventory is helping to make the market more balanced - more inventory means less bidding wars as supply rises. In Durham, the increase was 17.6% with 2283 active listings over 1941 last year. This helps to explain why prices dropped from last year's levels. The increase still isn't enough to make it a buyer's market, though. The average property in Durham still sold for 99% of asking. That's still close to being on par with the entire GTA, and is partly due to Durham having the lowest average prices in the region. The current trend shows 2.3 months of inventory. The MLS Home Price Index helps to normalize the statistics, by adjusting sales statistics to represent typical homes within MLS areas. 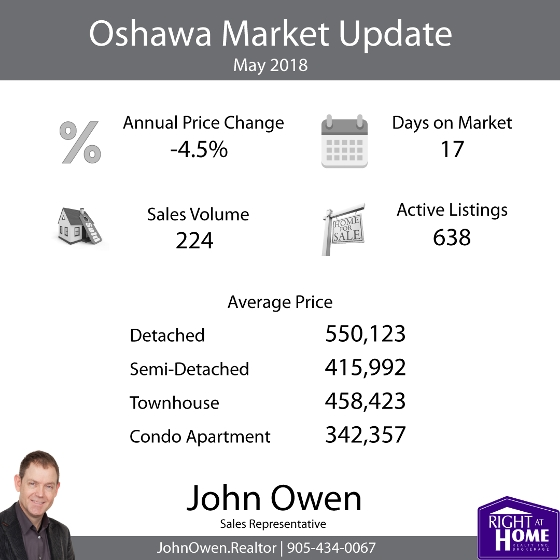 When using these numbers, Oshawa showed a composite annual drop of 9.19%, compared to the TREB average of -5.4%. Inventory levels continue at moderate levels with 2.6 months of inventory on hand across the board. This means that a current sales levels, all of the property would be bought up in the GTA in 2.6 months (if no new listings were added). In Durham, there is 2.3 months inventory. The average listing in Durham spent 17 days on the market. The TREB average was 20 days.